Can You Trust Bankrate's Bank Safety Ratings? In case you haven’t been paying attention, bank failures are on the rise. Given this little tidbit of nerve jangling information, I’ve recently spent some time writing about the safest online banks, as well as the banks at greatest risk of failure. For starters, just what is the “Safe & Sound” rating system? The majority of banks fall into the 3-4 star range. For the sake of comparison, ING Direct has a 3-star rating just like First Heritage, whereas E*Trade Bank, HSBC Direct, and Emigrant Direct all have 2-star ratings. 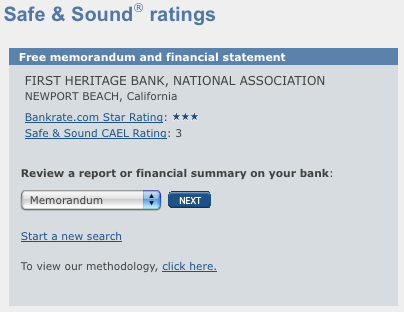 The top online bank right now is Everbank with a 4-star rating. The biggest lesson here is that Bankrate’s ratings can’t be viewed as an absolute indicator of bank health. While I have little doubt that the banks that they rate as being unhealthy are indeed unhealthy (e.g., IndyMac had a 1-star rating prior to their failure), it’s clear that an apparently healthy rating doesn’t necessarily mean that a particular bank is a safe bet. It remains unclear (at least to me) whether this particular case was due to a flaw in Bankrate’s methodology (or the underlying data), or due to the fact that the Safe & Sound ratings are only updated quarterly — a lot can change in a few months. Regardless, this is just another reason that you should never exceed FDIC insurance limits, no matter how much confidence you have in your bank. Hat tip to Sam for pointing out this article. I agree with Paul. We simply do not know, and bankrate cannot know, the extent of a bank’s leverage and derivatives in the “undocumented” investment vehicles. that’s the reason we are in the credit mess, because there was and is no “real” value on some of these investment vehicles that were used as leveraged investments. I always wondered about those ratings. This was an interesting article. You can also go to a CDARS partner. http://www.cdars.com There are about 2,000 banks that belong to CDARS and unless you have more than $50 million, you just get one statement, one interest rate and each account is FDIC insured up to $100,000. As long as the account has less than $100k. Who cares? If a bank “improves” its bottom line on paper by lumping its loans, good and bad, into one jumbo security and then selling that security to some Wall Street firm, then it’ll probably look better — and its numbers will crunch better — to outside entities like Bankrate, whose formulas many not take into account the funny numbers. I’d have to know more about how Bankrate crunches its numbers to be sure, but I suspect this is the case. Frankly, I’m quite happy to keep my hard-earned money in a bank in which the CEO is actually keeping an eye on underwriting standards, regardless of its Bankrate star ratings. Bankrate’s ratings can be useful, but take them with a grain of salt — and never, never exceed FDIC insurance limits on any bank accounts anywhere. one problem may be bank “investments” include derivatives and leverage. I suspect its difficult to gage the volatility of these, even by professionals, and alot of banks are hoping and praying for no black swan events. also, I don’t know if the $100k FDIC is getting adjusted for inflation. $100k is way less purchasing power than even 10 years ago, especially in the context of the housing bubble. It could get tedious for people to have 1/2 dozen bank accounts, along with a myriad of brokers, and other money oriented accounts. That is some very interesting news. Not sure how Emigrant Direct, HSBC Direct, and ING Direct are all rated so low but like you said, Bankrate isn’t the end-all when it comes to the health of institutions. I have always believed that it is important to do your own research into such matters and use sites like Bankrate as a guide. Of course, the tiny regionals are going to be more suspect than the century-old institutions but anything can happen in this day and age. 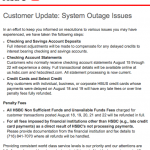 I’m sure all of this won’t help change the misconceptions regarding online banking. I attempted to that on myself, but only time will tell what happens from here.